The semifinals signal the start of the business end of the tournament. This is the stage where the fairytales come to end. All the teams left have an equal chance of emerging as world champions. There is no room for error. All this amounts to the prospect of two mouthwatering games, with thrills and spills aplenty as the four teams left to battle it out to secure the first of the two more victories they’d need to emerge as world champions. This year’s World Cup hasn’t been short on drama, with perennial favourites Brazil, Argentina, Spain and Germany all losing out in the early stages. 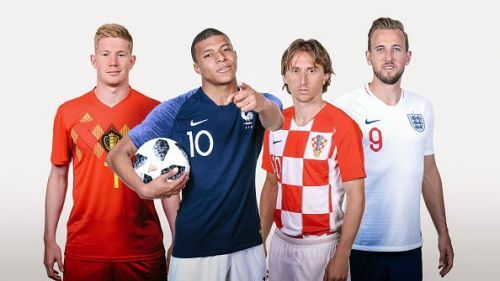 That leaves us with Belgium, England, France and Croatia in a pan-European battle for supremacy. As we enter the fourth week of the World Cup, with four teams remaining, this article takes a look at the four most iconic games at the last four stage. Facing England at Wembley was never a prospect any opponent liked. In the World Cup semifinal in 1966, Portugal found themselves with this thankless task, taking on the host nation who were backed by a crowd of more than 90,000. Portugal may have been playing in the tournament for the first time, but they certainly weren’t there to make up the numbers. Blitzing defending champions Brazil in the group stage itself was cause enough for fans to sit up and take note of the debutants. They followed that up with a 5-3 win over North Korea, having been 3-0 down at halftime. The architect in chief for Portugal’s successes was Eusebio, who had already racked up seven goals in the tournament. The English, however, were in no mood to play generous hosts to their upstart opponents. Sir Alf Ramsey’s men were notorious for their physicality, and they made no exceptions in this match, with a place in the final at stake. After a few defensive scares, England asserted their dominance and scored the opener through their legendary striker Bobby Charlton – a loose ball fell to his feet and he let fly from around twenty yards out, beyond the despairing dive of the Portugal custodian. Eusebio had been hogging the headlines throughout the World Cup, but the English defence kept him remarkably quiet. Marshalled brilliantly by Jack Charlton and captain Bobby Moore, England didn’t offer the ‘Black Panther’ a yard of space. Portugal, however, wasn’t a one-man team, and the likes of Simoes and Jose Torres still offered plenty of threat going forward, and they had their share of chances. The game was hanging in the balance with England defending stoutly to protect their slender one-goal lead as Portugal came at them with increasing urgency. 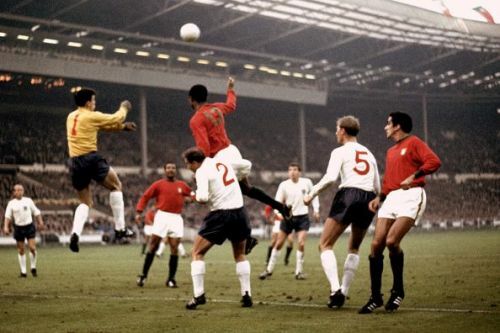 Up stepped Charlton yet again – collecting a pass, he struck it sweetly from the edge of the penalty box to double England’s lead, prompting pandemonium inside Wembley. Portugal still had fight left in them and within minutes, Eusebio pulled one back from the penalty spot, leading to a nervous finale as a tiring English backline held firm as the clocked ticked towards ninety minutes. However, Portugal couldn’t find an equalizer, and their World Cup fairytale was over. England were through to the final, where they would eventually beat West Germany to win their only World Cup so far. Charlton may have been the hero for the English with his brace, but this game is remembered because of the exploits of his brother Jack, whose heroics in defence kept one of the greatest attackers of his generation subdued in an otherwise absorbing contest.